Listen live Thursday February 24, 12 Noon EST. Four Papers on ‘Aids’ that Make You Say, WTF?! 1700 Italy: Cotton dust caused a significant outbreak of respiratory complaints (byssinosis) during the pro- cessing of cotton, flax, and soft hemp. 1767 Devonshire, England: Lead-contaminated cider caused colic; later, gout was associated with this same episode. 1700s England: Polycyclic aromatic hydrocarbons caused excess scrotal cancer in men who were exposed as chimney sweeps. 1800s New Jersey: Mercurous nitrate used in the felting process of the hatting industry led to mercurialism. 1828 France: Bread and wine contaminated with arsenious acid caused an estimated 40,000 cases of polyneuropathy [major nerve damage, ie, ‘polio’ or ‘multiple sclerosis’]. 1846 Canada: Lead from soldered cans contaminated foodstuffs in the Franklin expedition. 1900s Staffordshire, England: Arsenic-contaminated sugar was used in beer manufacturing. 1900s United States and India: Naphthylamine used in the dye industry resulted in an increase of bladder cancers. 1910 Manchester, England: Polycyclic aromatic hydrocarbons were associated with scrotal cancer: 24 in active mulespinners (cotton textile factory workers), 5 in former mulespinners, 1 in a chimney sweep, and 22 in tar and paraffin workers. Shale oil was used to lubricate the spinning cotton spindles. 1915 to 1918 Ypres, Belgium: Chlorine, phosphorus, and mustard gases resulted in 100,000 dead. Overall, there were 1.2 million deaths from chemical warfare in World War I. 1920s to 1990s Worldwide: Asbestos exposure resulted in a marked increase in asbestos-related disease and cancer. 1928 Cleveland, Ohio, Cleveland Clinic: Nitrocellulose-containing x-ray film burned. Cyanide, nitrogen dioxide, and carbon monoxide were generated during pyrolysis. This resulted in 97 deaths immediately and 26 additional deaths during the next month. 1930 United States, Europe, and South Africa: Triorthocresylphosphate resulted in ginger jake paralysis, a neurotoxic disease affecting tens of people. by Ralph R. Scobey, M.D. Syracuse, N.Y. Statement prepared for the Select Committee to Investigate the Use of Chemicals in Food Products, United States House of Representatives, Washington, D.C. The disease that we now know as poliomyelitis was not designated as such until about the middle of the 19th Century. Prior to that, it was designated by many different names at various times and in different localities.1,2 The simple designations, paralysis, palsy and apoplexy, were some of the earliest names applied to what is now called poliomyelitis. Colton5 (1850) mentions the case of a patient who swallowed some arsenic accidentally and was admitted to the hospital. The primary effects of the poison had been successfully combated with proper remedies, but seven days afterward he became paralyzed. It is significant to note that there was a latent period of several days before the paralysis appeared since this delayed reaction is comparable to the incubation period in infectious diseases. Vulpian6 (1879) experimentally produced paralysis of the extensor muscles of a dog by lead poisoning. The lesions, consisting in colloid degeneration and cell atrophy of the anterior horn cells of the spinal cord were pronounced by Vulpian as poliomyelitis. Adamkiewitz7 (1879) reported two parallel cases, one of poliomyelitis and one of lead poisoning. In 1881, Popow8 of St. Petersburg, published an essay upon the pathological anatomy of arsenical paralysis as produced artificially in animals. The work of Popow was carried out under the guidance of the distinguished neurologist and microscopist, Professor Mierzeyeski. Popow concluded that arsenic, even in a few hours after its ingestion, may cause acute central myelitis or acute poliomyelitis. During an epidemic of poliomyelitis in Australia in 1897, Altman 9 pointed out that phosphorous had been widely used by farmers for fertilizing that year. This observation may be of significance since in recent years organic phosphorus insecticides, such as parathion, have been suspected as possible causes of poliomyelitis. Onuff 10 (1900) reported a case of a painter [paints were lead based] with flaccid paralysis of both legs, in whom the autopsy showed lesions characteristic of poliomyelitis. Obsrastoff 11 (1902) reported a case of acute poliomyelitis resulting from arsenic poisoning. Phillippe and Gauthard 12 (1903) reported a case of anterior poliomyelitis from lead poisoning. Collins and Martland15 (1908) reported a case of poliomyelitis in a man, 38 years of age, which resulted from the use of cyanide as a silver polish. The illness began with diarrhea, followed by headache and pain and stiffness in the back of the neck. About eight days after the onset of the illness, he became paralyzed. In discussing Collins and Martland’s paper, Larkin stated that he had seen one instance of this disease following potassium cyanide poisoning. In the spring of 1930, there occurred in Ohio, Kentucky, Alabama, Mississippi and other states an epidemic of paralysis.16,17 The patients gave a history of drinking commercial extract of ginger [Jaked Ginger, with organophosphates]. It is estimated that at the height of the epidemic there were 500 cases in Cincinnati district alone. The cause of the paralysis was subsequently shown to be triorthocresyl phosphate in a spurious Jamaica ginger. Death resulted not infrequently from respiratory paralysis similar to the bulbar paralysis deaths in poliomyelitis. On pathological examination, the anterior horn cells of the spinal cord in these cases showed lesions similar to those of poliomyelitis. In one community all of the patients developed paralysis in the same lower limbs and buttocks in which they had received the injections and this pattern was repeated in 37 other villages, whereas there was no paralysis in uninoculated districts. The natives accused the injections as the cause of the epidemic of poliomyelitis. Most of the cases of paralysis occurred one to tow weeks after the injection of the arsenic. The foregoing reports indicate that poisons can cause poliomyelitis. It would appear that not any one poison in particular would be responsible for all cases of poliomyelitis but the effect of any one of several could produce the same ultimate result. When a disease is known to be caused by a poison, it is obvious that a search for a germ or virus in relation to it would not be made. Conversely, if a so-called virus is believed to be associated with the disease, then the possibility of poisoning as the cause of the disease would not be considered. It will be shown, moreover, that some so-called virus diseases and virus inclusions can be caused by poisons. All of this was KNOWN. And ignored. Following a recent extensive trip through the South, Dr. Mobbs informed me that wherever DDT had been used intensively against polio, not only was there an epidemic of the syndrome I have described but the incidence of polio continued to rise and in fact appeared where it had not been before. This is not surprising since it is known that not only can DDT poisoning produce a condition that may easily be mistaken for polio in an epidemic but also being a nerve poison itself, may damage cells in the spinal cord and thus increase the susceptibility to the virus. DDT is an organochlorine, and a neurotoxin. US Department of Agriculture found that although fodder treated with DDT caused no damage to the cows eating it, the health of their calves was severely impaired, sometimes with fatal results. The DDT was passed along from cow to calf via the milk (Van Nostrand’s Encyclopedia of Science and Engineering, Van Nostrand Reinhold 1995, v 5, p1775). DDT is a neurotoxin and the calves developed something very much like infantile poliomyelitis. Calves weren’t the only infants drinking cow milk during the early 1950s. 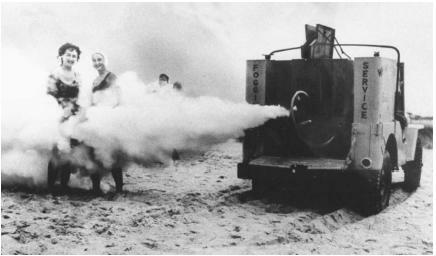 “DDT is good for ME-E-E!” Says US Govt to moms. Polio vaccination begins; Polio rates increase, and the percentage of severe and paralytic polio skyrockets. From contemporary reports there were nine times more polio cases in 1957 than in 1956, and that they were more serious than ever before. In the first 8 months of 1957 the Public Health Service reported, out of a total of 3,212 polio cases, there were 1,055 cases of paralysis, or 33.5% of the total. From January 1st to August 1958 there was a total of 1,638 cases of polio, with 801 of them paralytic, or 49% of the total. The New York Times on May 11, 1956, reported on Supplement No. 15 of the Poliomyelitis Surveillance Report for the year which showed 12% more paralysis in 1956 than in 1955. By January 1, 1957, 17 states had rejected their supplies of Jonas Salk’s “anti-paralytic” polio vaccine. During this year very nearly half the paralytic cases and three-quarters of the non-paralytic cases in children between the ages of 5 and 14 years occurred in “vaccinated” children. After 1955, NON-paralytic polio also acquired a new name. It wasn’t until the mid-1950’s that new laboratory techniques of culturing viruses could distinguish THIS polio from its clinical twin, aseptic meningitis. Before 1960, not a single case of “aseptic meningitis” was reported. Then, it was called (non-paralytic) “polio”, and nationally had totaled 70,083 between 1951 and 1960. But from 1961 to 1992, there had been 220,365cases of aseptic meningitis. There were only 589 cases of non-paralytic polio from 1961 to 1982. Not a single case has been reported since. Non-paralytic polio may have “disappeared”. But thousands of children still experience the same symptoms as non-paralytic polio every year. Except now, it goes by another name. It’s necessary to remember that polio was viewed as mostly, 90 to 95%, non-paralytic. Now, the polio ‘bug’ is considered to cause about .5% rate of paralysis. In other words, it is believed to be 99.5% non-paralysis inducing. But, this ignores all toxicological poisoning. Also, it should be noted that most cases of “polio” today are, in fact, not ‘associated’ with the little stomach bug (a tiny particle, about 1/1000th the size of a cell). These cases, the majority of paralysis occuring, are called “non-poliomyelitis acute flaccid paralysis,” or, Non-polio polio! The medical authorities now ‘associate’ many ‘viruses’ with non-polio polio. Epstein Barr, Guillan-Barre’, Coxsackie, and West Nile. So, why do we vaccinated everyone in the world against a bug that doesn’t cause illness? And what are we ‘vaccinating’ them with? What are the proteins, contaminants, bacteria, mycoplasma, heavy metals, adjuvants, and other contaminants? And what do they do in the body? Polio incidence increased after vaccination. Polio Vaccination was considered a morbid disaster of ruinous proportions in the 50s. Paralysis rates shot up exponentially. Children were quickly paralyzed, and in the arm WHERE they were injected. You to the medical establishment: ???????? … !!!!!! One little ‘factoid’ I discovered, quite by chance, is that two compounds were also mixed with DDT – Triton X-100 and Tween 20/80. These two ingredients are currently in vaccines. Outstanding article! Keep up the excellent work! Pingback: Meet the Main Ebola Assholes: Ebola is cover for a carefully planned treasonous military agenda arranged to lead to a fascist coup in the US | 2012: What's the 'real' truth? Pingback: MILITARY and MILITIA ALERT: Massive FEMA Drills in November Perfect Set Up To Contaminate US Water Supplies, and To Install or Load Live Virus Sprayers | 2012: What's the 'real' truth?